MirandaNet supports 'web based communities of practice'. As well as encouraging research and professional development, it works to establish communities of 'e-citizens' around the world and provides support and advice for those overseas wanting to learn from UK teachers' experience of ICT in education. My work with the Free State Department of Education was part of an exciting MirandaNet project - that's where I met the cheery young man whose picture you can see here. Find out more about MirandaNet here. 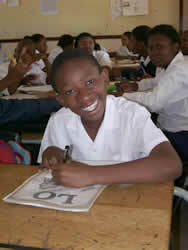 St Bernard's School: find out about the e-Lapa project at this school in Bloemfontein in 2004 and 2005 here. Picture page: pictures from MirandaNet projects. Global Gateway: a website from the British Council - it includes a database of schools seeking partners.